Plus: all orders will receive a FREE postcard pack of photographs by The River cover photographer Frank Stefanko, outtakes from the cover sessions (see below for images). Exclusively from Backstreets, just an extra something to say thanks for ordering from us. On the eve of the 35th anniversary of The River comes the long-awaited news that Bruce's first #1 album will appear as part of a massive box set in time for the holidays. For longtime fans, the big draws will be more than two-and-a-half hours of stunning, multi-camera concert footage from the River tour's stop in Tempe, Arizona, and 11 previously unreleased studio outtakes. 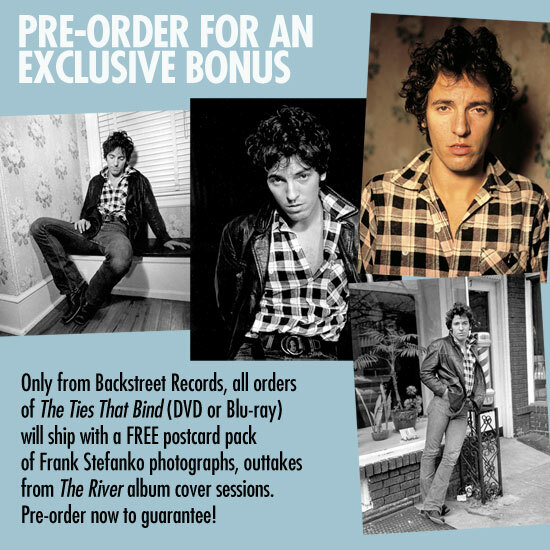 These elements are part of The Ties That Bind: The River Collection, a multi-disc collection due December 4 that follows in the tradition of Born to Run 30th Anniversary Edition and The Promise: The Darkness on the Edge of Town Story. Like those box sets, the 4-CD/3-DVD The Ties That Bind gathers remastered audio for the album itself along with never-before-seen concert footage and a Thom Zimny documentary; like The Promise, it also includes previously unreleased studio outtakes from the album sessions. All of these elements will be housed with a coffee table book in a 10" x 12" box. The audio: 52 tracks on four CDs, including the original The River double album (CDs 1 & 2); the first official release of 1979's The River: Single Album (CD 3); and a disc of 22 studio outtakes from 1979/80 (CD 4), half of which are previously unreleased. 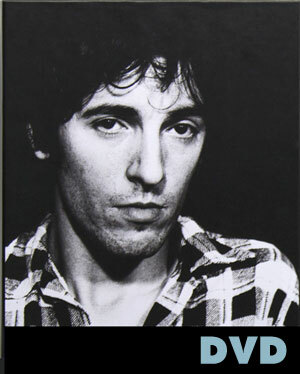 The video: Three DVDs featuring a newly edited film of never-released, multi-camera footage from Springsteen's famed November 5, 1980 show in Arizona -- a particularly intense performance, the day after Ronald Reagan was elected president -- with a running time of 2:40; rare tour rehearsal footage of five songs; and a new 60-minute documentary about The River, titled The Ties That Bind. 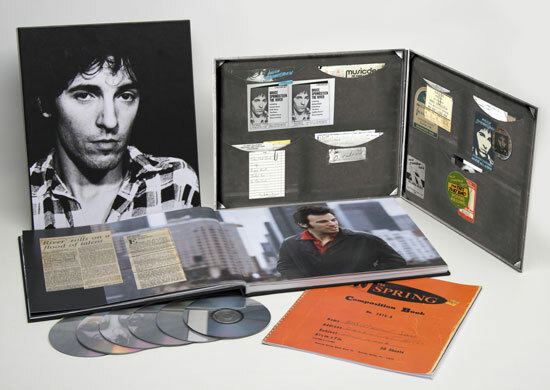 The set comes with a 148-page coffee table book picturing pages from Springsteen's notebooks, River-era memorabilia, and 200 rare or previously unseen photos, both studio and live, from photographers including Joel Bernstein, David Gahr, Jim Marchese, and Frank Stefanko. Text includes an updated Songs essay from Springsteen and a new essay by Mikal Gilmore, who describes The River as "pivotal... [the] hinge between the ambitious commotions that had preceded it and the more succinct musical riots, and sometimes terrifying storytelling, that followed."